Francis II of France, the first husband of Mary, Queen of Scots, was born on 19 January 1544, the eldest son of Henry II of France and Catherine de Medici, he was named for his grandfather, King Francis I. When Francis was four years old, the Scots and French signed the Treaty of Haddington in July 1548 arranging the betrothal of Mary Queen of Scots and the dauphin Francis in return for French aid to expel the invading English. Mary Queen of Scots sailed from Dumbarton for France in the August of 1548 when she was but five years old. The young Queen was accompanied by her four Marys, the daughters of Scottish noble families, Mary Beaton, Mary Seton, Mary Fleming and Mary Livingston. Mary spent the rest of her childhood at the court of her father-in-law, Henri II Her father-in-law, Henry II of France wrote 'from the very first day they met, my son and she got on as well together as if they had known each other for a long time'. Mary was a pretty child and brought up in the same nursery as her future husband and his siblings, became very attached to him. She corresponded regularly Mary of Guise , who remained in Scotland to rule as regent for her daughter. Much of her early life was spent at Château de Chambord. She was educated at the French court learning French, Latin, Greek, Spanish and Italian and enjoyed falconry, needlework, poetry, prose, horse riding and playing musical instruments. Francis and Mary were married with spectacular pageantry and magnificence in the cathedral of Notre Dame, Paris, by the Cardinal Archbishop of Rouen, in the presence of Henry II, Queen Catherine de' Medici and a glittering throng of cardinals and nobles. Francis was fourteen and Mary fifteen at the time, Francis then held the title King consort of Scotland until his death. On the death of Henri II, Mary's young husband Francois ascended the throne after the death of his father, Henry II, in a jousting accident in 1559, making Mary Queen Consort of France. Francis II was crowned king of France at Reims on 21 September 1559, by his uncle Charles, Cardinal of Lorraine. Among the wedding guests was James Hepburn Earl of Bothwell. Francis was reported to have found the crown of France so heavy that the nobles were obliged to hold it in place for him. The young Francis became a tool of Mary's maternal relations, the ambitious Guise family, who siezed the chance for power and hoped to crush the Huguenots in France. The Huguenot leader,Louis de Bourbon, prince de Condé plotted the conspiracy of Amboise in March 1560, an abortive coup d'etat in which Huguenots surrounded the Château of Amboise and attempted to seize the King. The conspiracy was savagely put down, and its failure led to increase the power of the Guises. This alarmed the king 's mother, Catherine de Medici, who reacted by attempting to secure the appointment of the moderate Michel de L'Hospital as chancellor. The health of the young king, which had always been fragile, deteriorated in November 1560 after he suffered a fainting fit on 16 November. After reigning for only seventeen months, Francis II died on 5 December 1560 in Orléans, Loiret, from an ear condition. Multiple diseases have been suggested as the cause of Francis' death, such as mastoiditis, meningitis, or otitis exacerbated into an abscess. Francis was buried in the Basilica of St Denis. 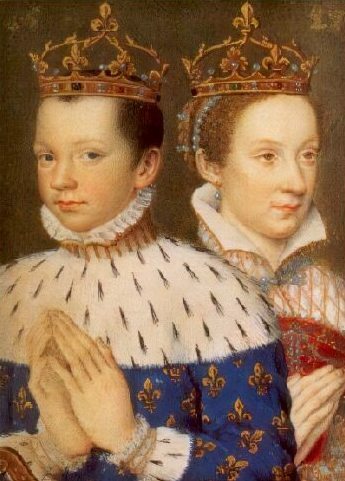 Francis' brother Charles IX succeeded to the French throne and the seventeen year old Mary, Queen of Scots prepared to return to her native Scotland.